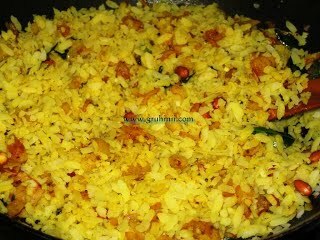 Clean and wash and drain Poha. Sprinkle some water and keep it aside for 10 to 15 mins. Heat one and half table spoons of oil in a pan and add rai, saunf and hing. 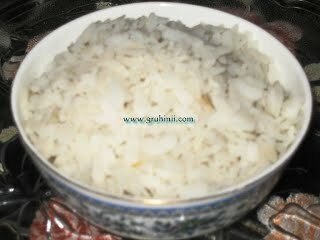 Let rai splutter, add ground nuts and fry well. 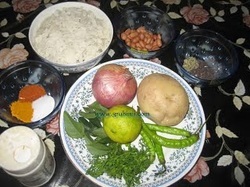 Now add finely chopped green chillies, onions, potatoes and curry leaves. Add dhaniya powder,salt and haldi. Stir and cook in a low flame till potatoes and onions become tender. Now add the soaked poha to it. Add sugar mix well cook for few sec. and switch off the flame. Add lemon juice as per taste and garnish with fresh coriander leaves.